Ultimate Nutrition has been in the bodybuilding supplement industry since 1979, and is definitely a company that are known for making trustworthy and effective supplements. One of their most popular products is the Iso Mass Xtreme Gainer. Compared to some other weight gainer powders currently available, it does not aim provide the most calories per serve, or anything else as intense. 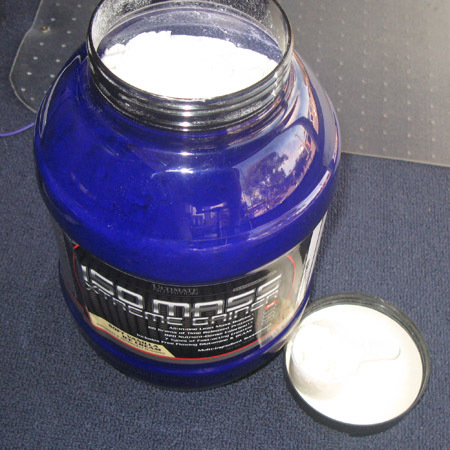 Instead, what makes Iso Mass special, is the fact that it is probably one of the most complete all in one weight gain powders in existence today. Iso Mass is not just a regular mass gainer. It is in fact an all in one supplement that contains ingredients to help with weight gain, pre workout performance, post workout recovery, and overall good health. With this product, Ultimate Nutrition has aimed to make a product that contains almost everything you need in a single convenient shake. One may be forgiven for not realising how complete Iso Mass is. A quick look at the product reveals that it could just be a run of the mill weight gainer made from a protein blend and a few carbs thrown in. But a more thorough look really makes you appreciate the amount of effort put into the formulation of this product. The first notable mention is the protein blend used. It contains a mix of five distinct protein sources; whey protein isolate (WPI), whey protein hydrolysate, egg protein isolate, three forms of casein, and milk protein isolate. This comprehensive spectrum of protein is impressive because it provides you with a range of proteins all the way from very slow to very fast digestion. This means that the product not only kick starts anabolism almost immediately after it is consumed, but it is also able to maintain amino acid release many hours later. Next is the carbohydrate blend. This is a mixture of waxy maize, whole oat flour, dextrose, oat fibre, and rice maltodextrin. Just like the protein blend, this carbohydrate blend provides immediate glucose release the simple sugars all the way to ultra-slow, sustained release from the complex carbohydrates. No weight gainer is complete without a good blend of healthy fats. Iso Mass is no exception and contains a mixture of canola oil, sunflower oil, medium chain triglycerides (MCTs), borage seed oil, flaxseed oil, and fish oil. This blend provides omega 3s, omega 6s, as well as other unsaturated fats and fast metabolising energy from MCTs. All in all, one 157 g serve of Iso Mass provides 570 calories, 60 g protein, 60 g carbohydrates, 10 g fat, 8 g sugar, and 4 g fibre. These macros can of course be boosted with the use of milk instead of water. If you think that the Ultimate Nutrition has stopped at the impressive macronutrient profile, you are greatly mistaken, because we have only really started to scratch the surface. Next on the list is the vitamin and mineral blend, which provides pretty much all the essential vitamins and minerals needed. A single serve provides anywhere between 33% to 83% of your recommended daily intake, depending on the particular micronutrient. This makes the product very nutritionally complete, can help to plug any deficiencies you may have, and is suitable for use as a meal replacement. Ultimate Nutrition also recognise the importance of glutamine in mass gain and recovery. Consequently they have also added an additional 2.5 g of glutamine in four different forms. In addition to this, there is also of course the obligatory addition of branched chain amino acids (BCAAs). Each serve contains an additional 3 g of leucine, valine, and isoleucine. This may help with increased muscle building and recovery. Next, there is a range of performance enhancing ingredients including a creatine blend containing 7.5 g of seven different creatines. This should be enough to maintain high creatine levels in even the biggest of bodybuilders. Iso Mass also contains a muscle pump boosting, nitric oxide matrix containing three forms of arginine, citrulline malate, and aspartic acid. The blend called the “Performance Mass” contains beta alanine, betaine, glycine, and methionine to help with stamina during training. Finally, Iso Mass contains a digestive enzyme blend containing protease and lactase to ensure that the product is not too taxing on your digestive system. Lactase in particular is of noteworthy mention, because this enzyme may make the product suitable for people with lactose intolerance. The difference between Iso Mass and the competition should be pretty clear now. Sure, there are other products out there that use a nice blend of proteins and carbs, but very few include this level of attention to detail. The added creatine, amino acids, NO boosters, and other performance ingredients in generous doses really set Iso Mass aside from many competitors. Unfortunately, flavour and mixability is not a strong point for Iso Mass. With so many ingredients, many of which are completely insoluble, it is easy to understand why mixability is a bit of an issue. Many may be surprised to see that Iso Mass does not mix as well compared to some other powders. Clumps do form and require a little more shaking than usual with a mixer ball to break up the clumps. Once mixed, the heavier particulates from the fibre component of the powder tend to settle quickly, so make sure you continuously whirl the shake as you drink. The smell of the shake may be considered a little unusual to some. Again, this is understandable as it if difficult to mask all the fragrances of the dozens of raw ingredients included in the product. The flavour itself is not too bad. It may be a little sweeter than what some people are used to, so if you prefer a blander taste, it is recommended to use more water. The flavour and mixability of Iso Mass is really one of the few criticisms for Iso Mass. However, as mentioned before, it is an extremely difficult task to get superior taste when there are so many ingredients being thrown into the mixture. Another potential negative for Iso Mass is that because of the complex nature of the product, it is on the upper end of the price range for weight gainer products. However, considering that it is an all in one, nutritionally complete product, it can actually be considered excellent value for money. The extra bit of money you spend on this product can actually mean that you do not need to buy additional supplements, such as creatine. Who is Iso Mass for? Iso Mass Xtreme Gainer is an extremely versatile supplement suitable for almost any one during the bulking phase of their training. It is ideal not only for everyday use to help meet macro and micro nutrient targets, but it is also an excellent post workout recovery drink. Iso Mass is possibly more suitable for mesomorphs and endomorphs. Ectomorphs may benefit more from a product with a higher carb content. However the high total calories provided per serve should not be overlooked, and Iso Mass may be better for that group than other weight gainers of a similar carb content. The product is extremely user friendly and great for beginners because it provides everything that is needed and eliminates the effort required in having to creating supplement stacks.